alaTest heeft 3072 reviews verzameld en geanalyseerd voor Amazon Fire 7. De gemiddelde beoordeling voor dit product is 4.5/5, vergeleken met een gemiddelde beoordeling van 4.3/5 voor andere producten in dezelfde categorie. Reviewers waarderen het gebruiksgemak zeer. Consumenten beoordelen dit product gemiddeld met 91/100 en experts beoordelen dit product gemiddeld met 73/100. Amazon Fire 7 Kids Edition review: For under £100/$100 the tablet isn't just hardy, it features mainstream content perfectly suited to youngsters. Don't worry about the lacklustre internals, buy this for the year of amazing kid-friendly content included in the price. The 7-inch version of Amazon's kids tablet has the great software and warranty features of the 8-inch version, but falls behind in speed, screen and sound. 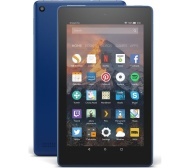 This very low-cost tablet includes a wealth of extras, including deep parental controls, a no-questions-asked two-year warranty and Amazon's excellent FreeTime Unlimited service. Onboard storage is expandable via microSD card. The very basic Amazon Fire 7 Kids Edition tablet has great software for kids and parents, but the slightly more expensive 8-inch version is a better all-around pick. Amazon's entry-level tablet received some modest updates, including a slightly thinner design, an extra hour of battery life and enhanced screen contrast. Despite its performance limitations, you'll be hard-pressed to find a better entry-level tablet than the 2017 Amazon Fire 7. This $99 device with Amazon's two-year "Worry-Free" warranty is the perfect tablet for a child, as long as great picture and sound aren't that important to you. Slow performance; Subpar battery life; Lock-screen ads ; For under $50, the Fire 7 offers a solid design and offers easy access to Amazon's content, but mediocre performance and endurance dim the flame. For under $50, the Fire 7 offers a solid design and offers easy access to Amazon's content, but mediocre performance and endurance dim the flame. If you’re looking for a cheap, surprisingly capable tablet suited for use with children, look no further. Amazon has packed the Fire 7 Kids to the brim with features at a highly tempting price.